When my children were young, an older relative gave us a petite set of books by the children’s author Beatrix Potter. With their warm water-color illustrations and sweetly droll humor, the books soon became a favorite of mine. I think the girls liked them, too. 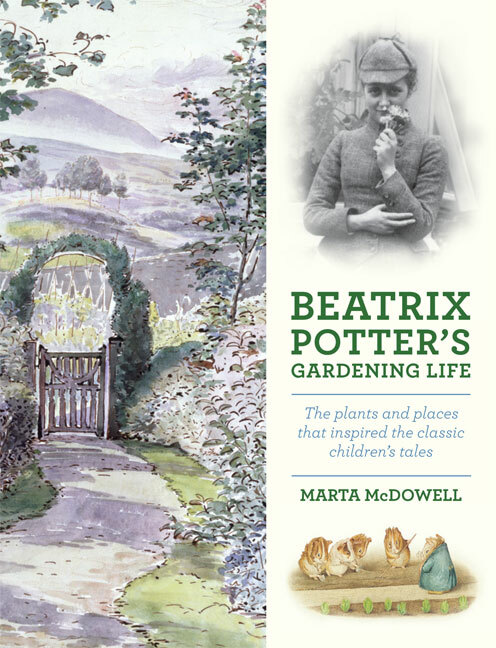 So I was thrilled to receive a review copy of Marta McDowell’s Beatrix Potter’s Gardening Life: The Plants and Places that Inspired the Classic Children’s Tales (Timber Press, 2013). Potter’s books are filled with illustrations and stories that gardeners can appreciate, from Peter Rabbit’s forays into Mr. McGregor’s garden (the longer I garden, the more I side with Mr. McGregor) to silly Jemima Puddleduck picking onions and sage for a dinner at which she is to be the guest of honor — and the main course — to country mouse Timmy Willy, who falls asleep in a peapod before he is shipped off to the city in a basket of garden produce. Potter loved nature and the country life and her stories and illustrations show it. McDowell’s book is really three books in one, and each has its own merits. The first part is a biography of Potter, a shy and lonely girl, who took refuge in keeping rabbits and drawing plants and animals. She was a skilled botanical illustrator (mushrooms were a particular specialty) but achieved recognition when The Tale of Peter Rabbit was published in 1901. Her parents were the demanding Victorian type, and disapproved of her writing as well as her romance and engagement to her publisher, Frederick Warne. Sadly, Warne died in 1905 from leukemia. Grieving and seeking independence, Potter bought Hill Top Farm in the Lake District of western England. There, she continued to produce books (23 in all) and garden. At 47, she married a local attorney and began to buy more property in the area. She published her last book in 1922, and spent the final 25 years of her life as a farmer and conservation activist in the Lake District. The biography section of the book is entertaining, marked by vibrant prose and an abundance of drawings and photographs. 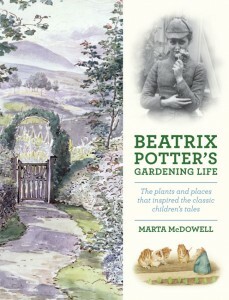 You get a genuine sense of how Potter’s books reflected her interest in nature and her life as a gardener. The second section takes a reader through the year in Potter’s garden, from the dark winter to the blooming primroses in June to fall and the harvest season. It’s evocative and well-illustrated and gives a full picture of English country life. Through letters and other material, McDowell shows Potter dealing with many of the problems familiar to all gardeners — invasive plants, poor weather, more ideas and work than time. The last section is a short introduction to visiting Potter’s gardens and farms and the Lake District. Potter left most of her property to the National Trust, so there is a lot to see, if you are able to get to this somewhat out-of-the-way part of England. The book is rounded out with resources and suggestions for further reading as well as plant lists, including lists of all the plants that appear in each of her books as well as those she cultivated. For Potter fans or lovers of English country life that is not of the Downton Abbey variety, this gardener’s biography is a great read.